Our Certificates of Deposit offer guaranteed yields, flexibility, and the safety of FDIC insurance. You know exactly what return you’ll get and when you’ll get it. 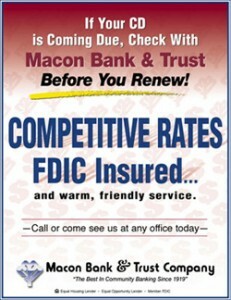 Your investment is safe because Macon Bank & Trust Company CDs are backed by the Federal Deposit Insurance Corporation for up to $250,000 per individual – making them as safe as any investment in the world. We offer Certificates of Deposit in a broad range of maturities, each designed with a particular goal in mind. And, for as little as $1000, you can open your own CD. To help you decide which CD will best meet your needs, take our One-Minute Certificate of Deposit Test. Then request a CD quote from one of our Customer Services Representatives today at 615-666-2121.